First Read's Morning Clips: Will Broward's ballot design cost Democrats? MIDTERM MADNESS: Will Broward’s ballot design cost Democrats? AZ-SEN: Kyrsten Sinema has widened her lead by about 32,000 votes. Here's where the remaining votes are. Trump is alleging corruption in the Arizona count — without offering evidence. FL: Republicans are alleging, without evidence, that Democrats are trying to "steal" seats in Florida as votes continue to be counted in both the Senate and gubernatorial contests. Steve Kornacki looks at the issue of ballot layout in Broward County. Here's what the president is tweeting this morning Error! Hyperlink reference not valid. Republican state officials are pushing to have the police involved in oversight of the recount, including taking custody of machines and ballots when the votes aren't being counted. 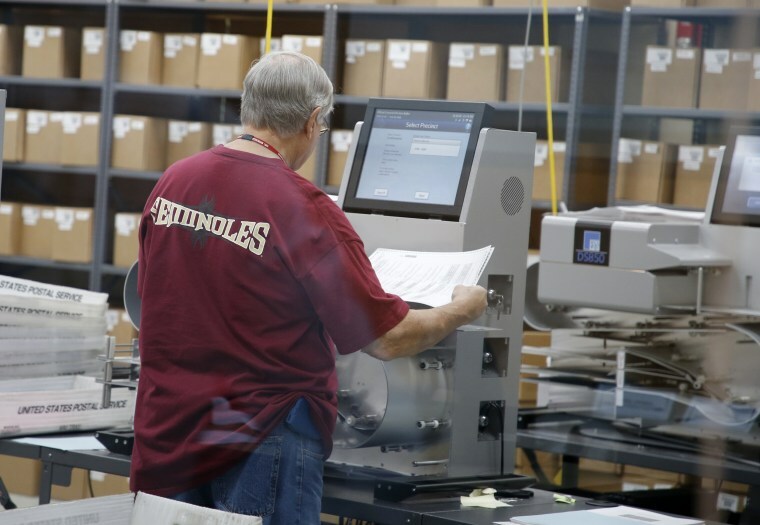 Could a recount possibly change the outcome? That would be unprecedented. Here's the New York Times with a look at how common voting problems are — and how seldom they are noticed. Even as a recount controversy roils, Ron DeSantis is trying to figure out how to hire new staff. GA-GOV: The State Election Board has voted unanimously to send every county guidance on how to count absentee ballots. Kemp's lead has shrunk to about 59,000 votes, and Abrams is filing in a new lawsuit to force the counting of more provisional ballots. Even without an Abrams-Kemp runoff, there's going to be a high-stakes runoff to replace Brian Kemp. MS-SEN: Tensions are high in Mississippi after video surfaced of Cindy Hyde-Smith, who is in a runoff against black Democrat Mike Espy, using the phrase "public hanging" in a joke. TX-2: SNL comedian Pete Davidson apologized face-to-face to Rep-elect Dan Crenshaw for a joke made about his appearance last week. Richard Ojeda has formed a presidential campaign committee. For 2020, the New York Times says Dems face a choice of being daring or defensive. TRUMP AGENDA: What are those 5,200 troops at the border doing? What are 5,200 troops even doing at the border? Veterans haven't received GI Bill payment for months because of IT issues at the VA. The death toll in the California Camp Fire is now up to 31. Democrats are dreaming of investigating Trump, writes Rebecca Shabad. But just because they're looking for answers doesn't mean they'll get them. Trump's NAFTA plan could be derailed by Democrats' takeover of the House. House Democrats are still rejecting impeachment calls, but they are talking about aggressive investigation of the president. And Patriot Majority is up with a six-figure TV ad (airing on national cable) that lays out the Democrats’ agenda in Congress – lowering health-care costs, rebuilding America and cleaning up corruption.